0.10 Mixed Size CLASSIC MAYFAIR MINK lashes B/C/CC/D are light lashes that are used for CLASSIC one by one natural sets. B, C, CC, and D curls available in 0.10 thickness so you can choose which look you want to create for your clients. 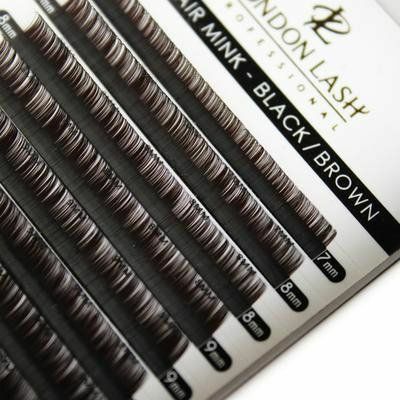 London Lash Pro handpicks premium quality material to produce the lashes your clients will be pleased with. They under go strict quality control and are made using high temperatures to create the curl. This makes them heat and water resistant. Best quality eyelash extensions are a key element for becoming a successful eyelash artist. Buy a couple of these and you're covered for a wide range of looks without the need to carry around lots of different packs or invest much money to get started. All our lashes are made from 100% Synthetic fibre. Need advice about 0,10 Mixed Size Black Brown Mayfair Mink Lashes C/CC/D?